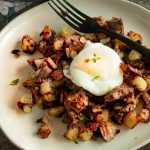 Breakfast Hash is a comfort food that you will come to love whenever you have a lot of leftovers. 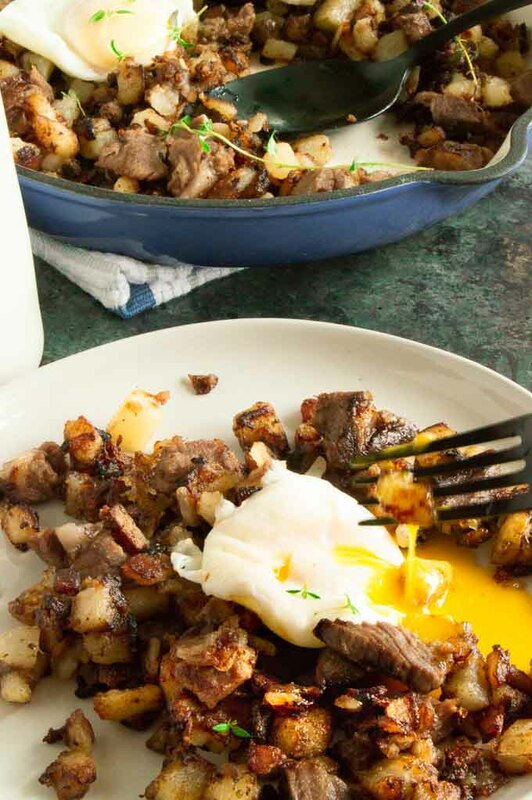 The hash base is made with crunchy potatoes, sautéed onions and leftover prime rib in this case. 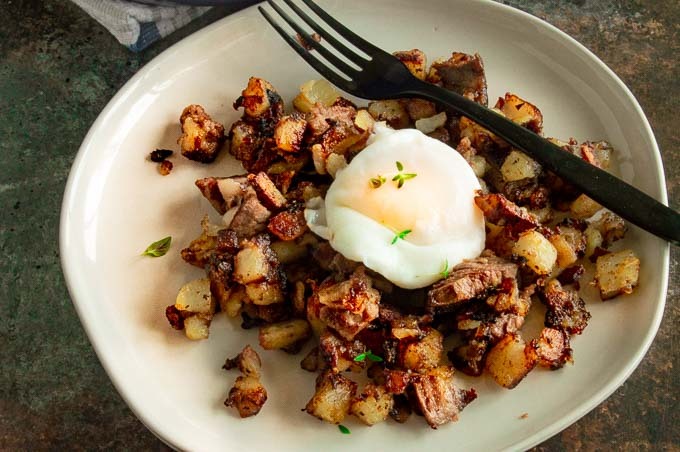 (I’ve also got an easy recipe for hash using Corned Beef here!) Over the top is soft cooked eggs so that when you cut into them the yolks join with the beef juices and create a delicious juicy, saucy bite. Hash got its name from the French word “hacher” meaning to chop and having all of the ingredients chopped to bite sized pieces has it live up to it’s name. 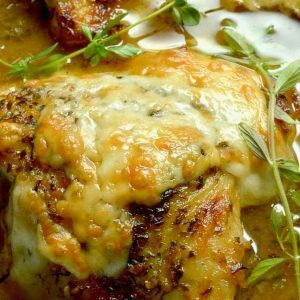 What ingredients are in a hash recipe? Meats: Bacon, chorizo, corned beef, ham, steak, chicken, turkey, sausage, prime rib, pork. Vegetables: Potatoes, Sweet Potatoes, green onions, onions, bell pepper, mushrooms, zucchini, squash, spinach, carrots, corn. Eggs: Poached eggs, eggs over easy are the normal choices, but if you want them scrambled, that will work too. As you can see, the list of possibilities is endless. Hash is very flexible. Traditionally all hash has onions and potatoes but beyond that you can pretty much use what ever vegetables or meats you have on hand to create it. 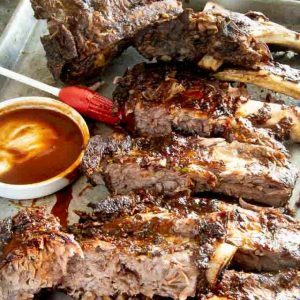 Most often the meats are made with leftovers (like this Easy 4 ingredient Prime Rib) but you can also go ahead and cook fresh the meat you are adding into it. 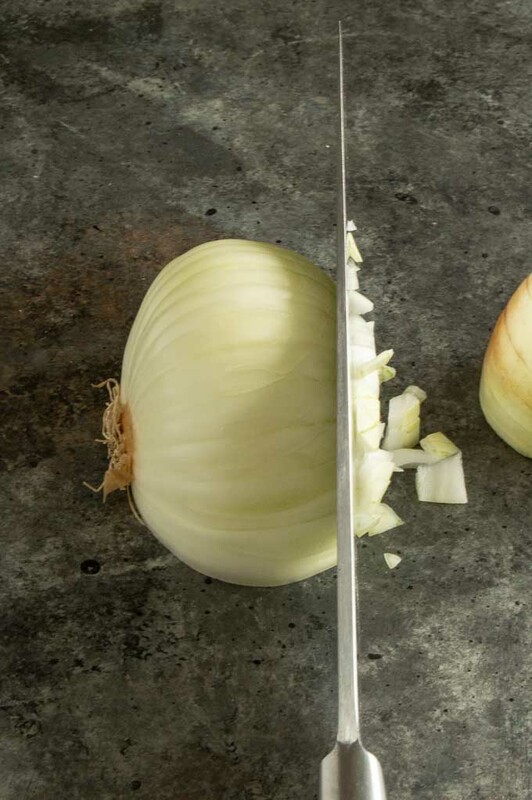 PRO TIP FOR CHOPPING EVEN VEGETABLES: One of the skills required to make a good hash is to chop the vegetables all the same size. 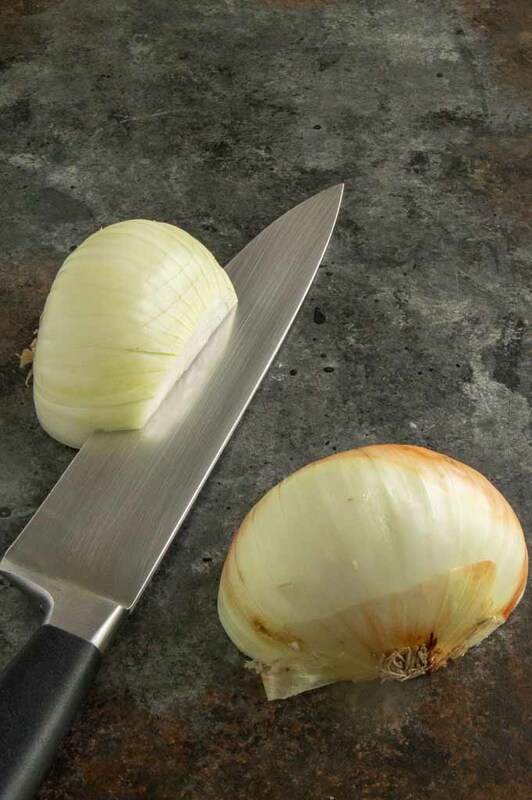 Simple steps in cutting the potatoes and onions will make quick work of all of the chopping you’ll need to do. Its your choice to peel or not, either way is fine. 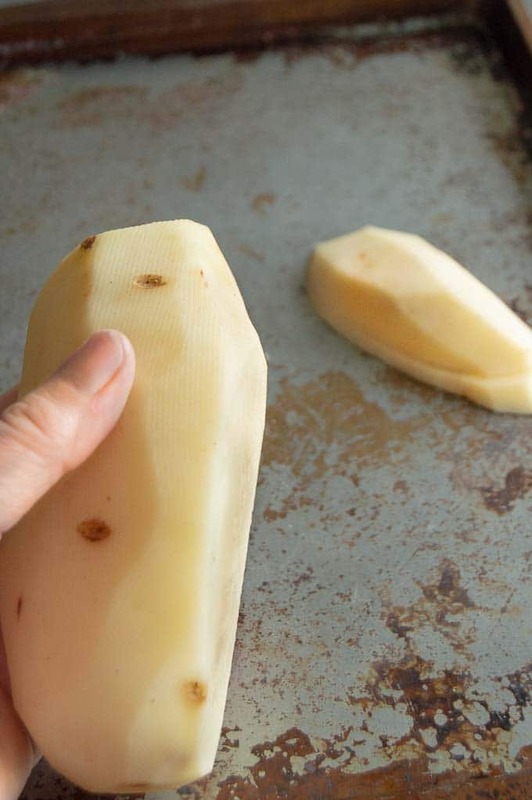 Cut the long side of the potato to create a sturdy flat base to do your cuts. This is for safety and to make quick work of cutting. Wobbly potatoes lead to cutting yourself versus the potato, please learn from my early childhood mistakes! 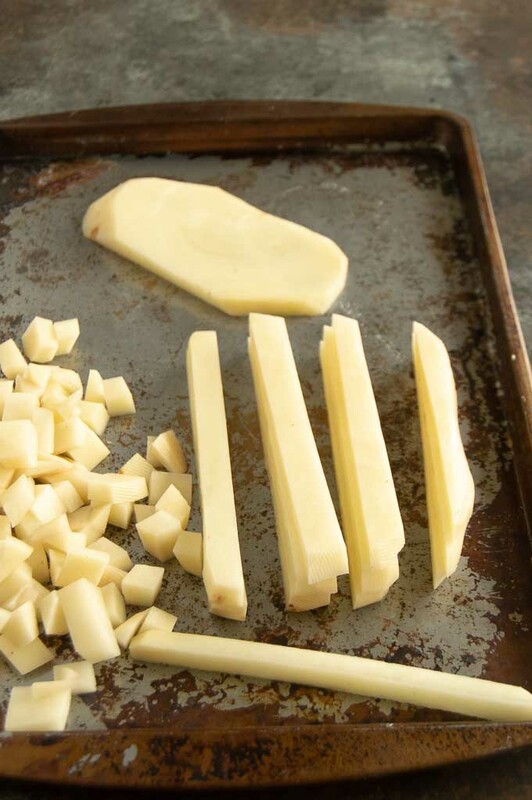 Place the potato on the flat side then lengthwise (as shown in the center pic) cut to 1/4″ slices. 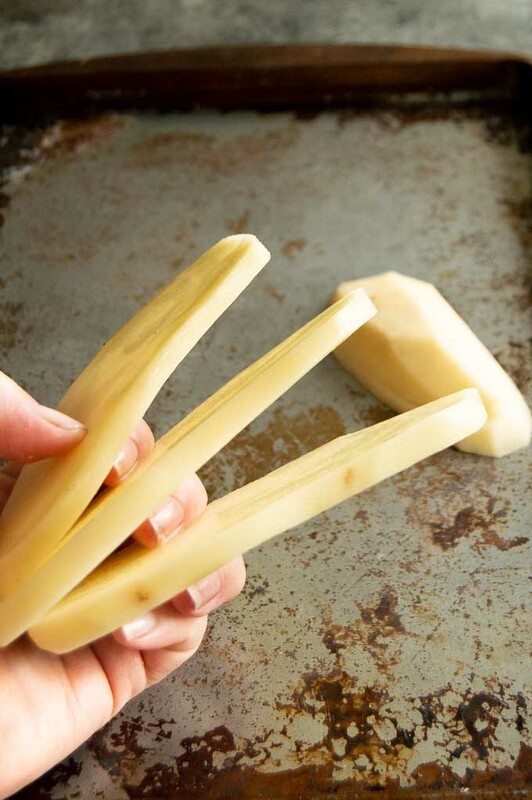 Turn the potato and cut those slices into small pieces. I like them tiny, but if you want them longer that is fine as long as they are all uniform to allow for even cooking. 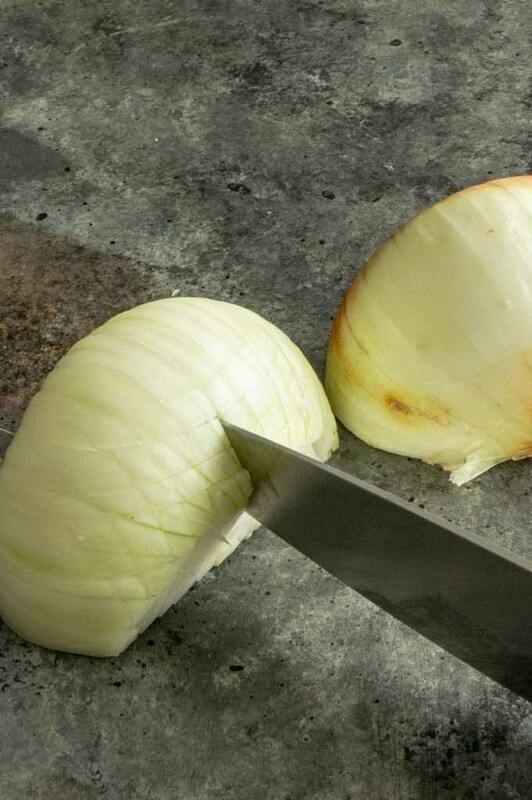 Cut the onion in half from the top of the onion peel to the roots. As I mentioned above, cut each vegetable or piece of meat you use to a uniform size. This makes it so everything is cooked through and even. Although any skillet will do, I prefer a cast iron skillet for cooking hash. It conducts heat evenly and the potatoes will get crispy and golden brown easily. Make sure the oil is hot when you are ready to start cooking. Hash has a lot less calories if the oil doesn’t absorb into all of the vegetables which it will do if its not hot enough. It also makes certain you won’t end up with soggy potatoes. To make sure its hot, test one potato in the oil first. If it sizzles right away you know its ready. If it doesnt start sizzling immediately, give it a few more minutes and test it again! When sautéing the potatoes, don’t go crazy and stir then all the time. Let them sit occasionally so they can brown and crisp a little bit. If you are cooking for really large crowds and have a lot of potatoes you may need to lengthen the cooking times. Once you have some browned edges, to speed up cooking large amounts of potatoes place a lid on them and let them steam for 5 or so minutes before finishing crisping them without the lid on. Dont be afraid to be creative. 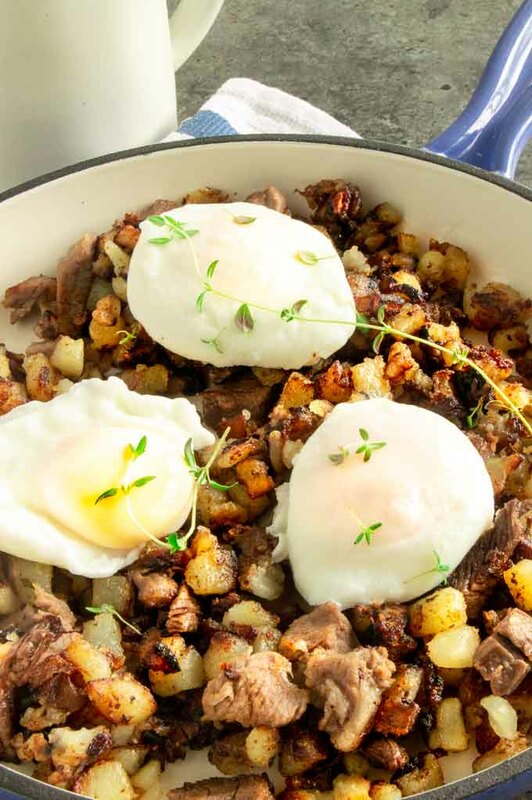 Use whatever you have leftover in your fridge to flavor this skillet hash. Have Vegetarian friends? Leave out the meat, the potato, vegetables and seasonings are very filling! Pin this to your Breakfast or Brunch Board on Pinterest! Lets Be Friends …. follow me on Pinterest for more ideas for stress free entertaining with confidence! 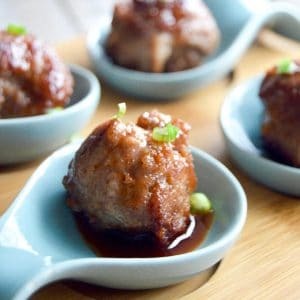 Cut your leftover meats into bite size pieces. Rinse diced potatoes very well, then toss in a towl to remove any excess water. (If the potatoes have any water with them, they will cause the oil to splatter when added to skillet. By rinsing the potatoes you are removing the starch from the sides, this allows for a more crisp textured potato. In large skillet turn on heat to high and get pan very hot. Once it is hot add olive oil to pan and swirl it around to coat entire surface area. Once pan is coated reduce heat to medium high. Add potatoes to pan, stirring occasionally so all sides are able to really brown and get crispy. Once potatoes are starting to brown add the vegetables, garlic, tarragon, salt and pepper. Once potatoes are thoroughly cooked and browned to a crisp 20-25 minutes, add your leftover meat and stir constantly until meat is warmed throughout about 5 minutes. Create small wells to fit a cracked egg into. Place eggs into the well, cover with a lid and cook about 3 minutes until egg whites are solid white and the yolk is still soft. Alternatively you can poach eggs while the potatoes are cooking and place them over the finished hash recipe at the end before serving. Serve immediately. If you want a poached egg, follow recipe for poaching an egg in Frise Salad here https://www.westviamidwest.com/bacon-eggs-frise-salad/ and add to top of hash. This is a great way to use up leftover meats and vegetables. There is no set quantities because its just a mix of things you have. My family really likes potatoes so I add a few extra potatoes. I have a friend who is a vegetarian, so when I'm making it for her I can substitute tofu for the protein if I have it, or I can just use a lot more vegetables. 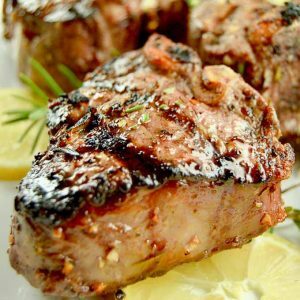 Because the meat goes in at the end, its easy to serve both hearty meat eaters and vegetarians with out sacrificing for either one. Wow! This hash looks amazing! That runny egg on one of the photos is calling my name! Love that you give us so many ideas on what to add to hash. Definitely making hash for brunch this weekend. A PERFECT USE FOR LEFTOVER PRIME RIB DINNER!